Convention exclusive. The two words many LEGO collectors dread to hear and several investors become giddy over. To some, these highly exclusive sets with their limited availability can be the Holy Grail of a LEGO collection. They are extremely hard to obtain, and can be very expensive unless you are lucky enough to be in the right place at the right time. In recent years as the popularity of LEGO has skyrocketed, these exclusive sets have become even more coveted. Retailing for just $40, they can be found at conventions such as the upcoming San Diego Comic Con (SDCC) and Star Wars Celebration. These sets are small with very low piece counts (averaging around 200) when compared to the price tag. Yet, for investors lucky enough to obtain them, they are instantly worth at least two to five times retail price. For LEGO investors, convention exclusives are easy money if you're looking for a quick flip. Especially they can be obtained directly from the LEGO booth for retail price. If your investment style is less "fast money" and more "buy and hold" these sets have traditionally seen incredible returns within 1-2 years of the convention as supply dries up and the sets become harder to get. At SDCC 2015 there were three exclusive sets released, all retailing for $40. One from the Marvel superheroes line, "SDCC2015-1: Throne of Ultron," one from Star Wars universe, "SDCC2015-2: Dagobah Mini Build," and one from the DC superheroes line, "SDCC2015-3: Action Comics #1 Superman." Every year when these sets go on sale over the course of the convention, before some sellers have even made their way through the winding lines up to the cashier at the LEGO booth, resellers are already listing them on sites like eBay, and Brick Classifieds. 2015 was no different and both Throne of Ultron and Dagobah Mini Build were being listed on eBay for between $100-$120, thee times the retail price. A 300% return on investment is amazing for any LEGO set and after 12 months these sets are still holding strong in the same price range but the prices are slow starting to climb and will probably be near $150 by the end of 2016. But what about the third set to be released? How did Action Comics #1 Superman perform? If you were an investor who got this set for $40 or even $100 you were jumping for joy! This was my personal favorite set of the trio, and unfortunately for my wallet, I was not in the minority. Initially Action Comics #1 was selling for $180-$250, few sets ever reach five times their initial retail, let alone reaching that mile stone before the ink on the receipt had dried and it didn't stop there. It seems that with this set the sky is the limit and recent prices on eBay reflect that. For those investors who braved the crowds and the lines at last year's SDCC Action Comics #1 Superman has become one of the most valuable LEGO convention exclusive sets to date and has recently started selling for anywhere between $300 and $600! An amazing feat for any set; but when you take into account Action Comics #1's "low" $40 price tag and a piece count of just 145 this set's performance is truly astounding. Both investors and collectors may ask: "When is the best time to buy these convention exclusives?" Or "How can I avoid paying astronomical prices on the secondary market?" Obviously the best way is to head down to sunny San Diego and attempt to buy the sets right from the source; but since that isn't an option for most people, I have found that buying the set within the first few days of its release from people looking to do a quick flip can get you the best deal. After that initial rush when the market isn't nearly as flooded with sets, patience is key. Auctions can be a great way to save some money as they usually end a few dollars lower than if you were to pay a set price. Hover with auctions you run the risk of not having the winning bid. If you do decide to use the "Buy it Now" option on a site like eBay, be sure you research the going rate for the set and look out for unreasonably high shipping costs. If you watch the secondary market closely, eventually you might get lucky and find the set of your dreams for a steal of a deal. I was lucky enough to find my dream set, Action Comics #1 Superman, for just under $170 by catching the listing right after it was listed. With San Diego Comic Con just a few weeks away rumors of this year's convention exclusives are starting to swirl. Will you be traveling to Southern California to brave the crowds and lines for your chance at owning one of these highly coveted sets? What types of exclusive sets do you hope to see revealed this year? Let us know in the comments below and stay tuned to Brickpicker for the latest news as we move closer to the convention. Never forget to clean the HTML code and double check your content before publishing an article! This Comic Con game always stirs up some negative memories. Back in 2013, it turned into a bit of an FU LEGO, to which LEGO responded FU Resellers. It seemed a certain innocence was lost & relations have never been quite the same again. it's the exclusive minifigures that kill me. For example the 2013 Mini Bag End is not that overwhelming - most of them were sold for about 100$. Maybe its the worst of all SDCC ever made regarding its price after three years after release. Never saw these in Canada. At last year's Toronto Comic Con there was a mini set based on the Lars farm on Tatooine that came with a mini sandcrawler. I got one for me and one to sell and I finally sold it 6 months later for about a $20 profit as there was no appetite for it. The other thing to consider is that quantities are limited, and that as an investor you are lucky to get one copy of one exclusive. Purely from an investment perspective, you have to factor in the cost of the Comic Con tickets and the time you spend waiting in that line. Your ~$150 profit is likely wiped out by other costs. There is no one, not even "insiders" that can walk away with a couple cases of exclusives. As a collector and fan, its absolutely worth grabbing one of these if you can. As an investment strategy, there are better ways to spend your time and capital. I Bricklinked both the Dagobah and Action Comics sets. I would never pay that much for these official sets. Never saw these in Canada. At last year's Toronto Comic Con there was a mini set based on the Lars farm on Tatooine that came with a mini sandcrawler . I got one for me and one to sell and I finally sold it 6 months later for about a $20 profit as there was no appetite for it. That's the same set they had at Star Wars Celebration last year in Anaheim. I BL'd both those, the aforementioned Tatooine set, and the Ultron Throne set as well. I've got the Action Comics set on my desk at work. I love the look of the built set. It's a fun little set. Not a $40 set if it were retail. More like a $15 set. And honestly - if they sold these little dioramas, they would make a killing! I agree. Especially for superheroes. They could recreate the all time great comics covers like they did with the Action Comics set for both Marvel and DC. They could sell these in comics shops and bring in new AFOLs. I don't know why they don't do it. Going to the Star Wars Celebration event in London next weekend. Anyone know whether they'll be exclusives like at comic con? Is it normally first come first served? 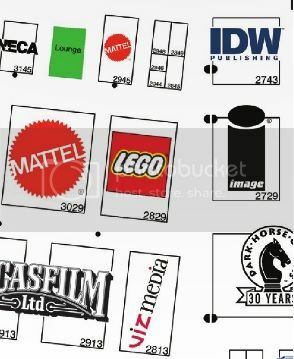 LEGO is not listed as a vendor/exhibitor, so I doubt there will be an exclusive. With SDCC the week after Celebration, they probably decided to only do one of the events. And, yes, at Celebrations so far it has been first come since they aren't quite (yet) as out of control as SDCC/NYCC. LEGO is not listed as a vendor/exhibitor, so I doubt there will be an exclusive. @Mos_Eisley was referring to LEGO not being a vendor at Star Wars Celebration Europe.